The American Tex-Mex fast food chain has opened its first location in Rio in the BarraShopping mall in Barra. RIO DE JANEIRO, BRAZIL – A new competitor has joined Rio de Janeiro’s crowded fast-food scene as American Tex-Mex fast food chain Taco Bell has opened its first location in Rio de Janeiro. First arriving to Brazil with a location in São Paulo in 2016, the chain has just opened a branch in the BarraShopping shopping mall in Barra da Tijuca. Crowds line up for Tex-Mex fast food favorites like the “XXL Grilled Stuft Burrito,” and the “Crunchwrap Supreme” at Taco Bell’s first location in Rio de Janeiro in Barra, photo by Nelson Belen/The Rio Times. 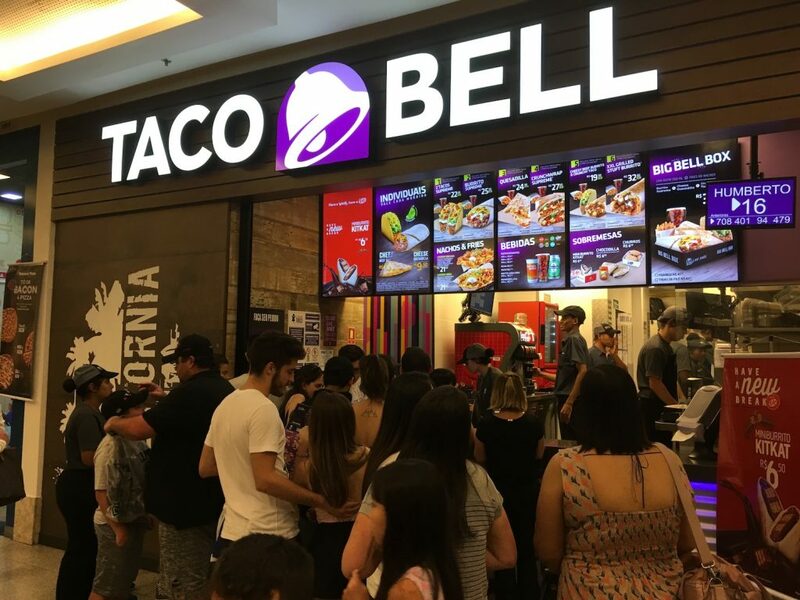 “[Brazil] has great potential both in terms of its geography and its food consumption,” said Taco Bell’s director of operations in Brazil, Daniela Heldt to Globo news. Heldt added that the company’s current goal is to open thirty locations in Rio and São Paulo over the next year and up to 200 locations by 2027. In addition to adopting the chain’s popular Tex-Mex dishes, including the “Crunchwrap Supreme” and the “XXL Grilled Stuft Burrito,” Taco Bell’s Brazilian locations have also made sure to add local flavor to its traditional menu. The BarraShopping branch is the first of five that Taco Bell plans to open in Rio by the end of 2019. Some of the announced locations include the malls Praia Shopping in Botafogo, Nova América in Del Castilho, and Shopping Tijuca in Tijuca. Currently, all the branches will be company-owned, but, according to Heldt, “we are already evaluating franchisees for the brand…. [O]ur agreement with Taco Bell in California makes us the brand’s owners in the states of Rio and São Paulo. But, we are negotiating to take over the entire country. Entrepreneur Carlos Wizard Martins, who had previously bought the fast-food chains Pizza Hut and Kentucky Fried Chicken, opened Brazil’s first Taco Bell location in São Paulo in 2016. Currently, the fast food Tex-Mex chain has 7,000 locations, of which approximately 6,500 are in the U.S.